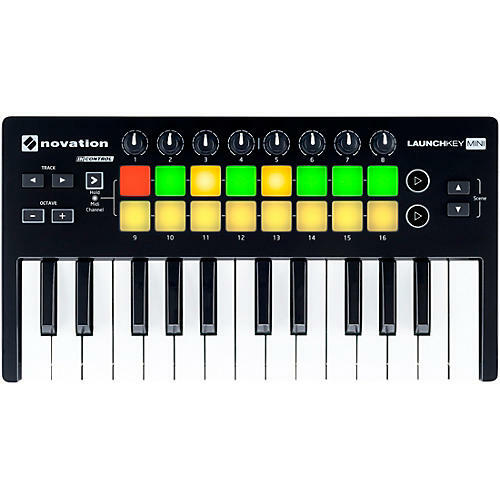 Launchkey Mini MKII is Novation's most compact and portable MIDI keyboard controller. It may be small, but it gives you everything you need to create new tunes in Ableton Live without cluttering up your desk. Includes 4GB of Loopmasters Samples, and one of four VSTs from XLN Audio’s Addictive Keys. Launchkey Mini MKII is compact and tough enough to throw in your bag, so you can take it anywhere. It will work the moment you plug it into your laptop and you wont need any drivers or power cables, because its class compliant and bus-powered via USB. You can also connect it to your iPad via a Camera Connection Kit to control all sorts of iOS music apps, like Novation's free Launchkey App. Launchkey Mini MKII also integrates immediately with FL Studio, Pro Tools, Reason, Cubase, and Logic without any mapping whatsoever. It comes with everything you need to start making music, including XLN Audio Addictive Keys, Ableton Live Lite, Novation Bass Station and V-Station virtual instruments, and 4GB of samples from Loopmasters.